We have a large supply of Refurbished Maquet Servo-i Respiratory Ventilators, one of the top-choice units for ICUs, NICUs and other hospital units. The Servo-i meets the performance and customization standards for high-pressure, dynamic environments. It supports both invasive and non-invasive ventilation, and can be configured to suit the needs of all patient categories and clinical situations. 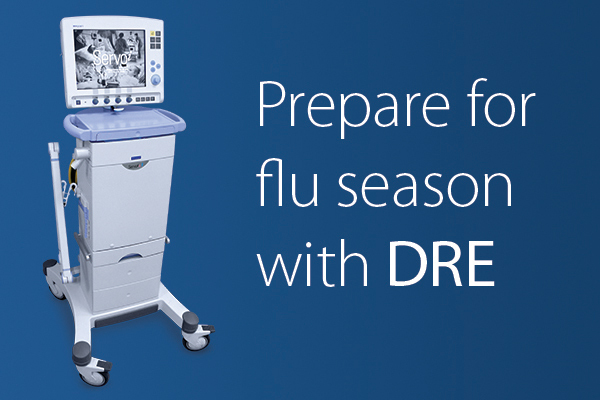 Secure your savings on a Refurbished Maquet Servo-i from DRE today, and check off an integral item on your flu-season readiness strategy. The surge of patients at peak flu season often strains the ventilator capacity of ICUs around the country. Purchasing additional ventilators now will head off these headaches before they arise. The cost benefits of the Servo-i are clear, as this multi-purpose unit eliminates the need to invest in multiple types of ventilators for different patient categories. The units can also be upgraded as your needs change. DRE has been serving hospitals, ICUs and other medical facilities for 30 years. Our experienced sales consultants have the knowledge to guide customers through the buying process, getting them the right equipment at an affordable price. Our inventory is always growing to incorporate the latest technologies and to accommodate seasonal needs. We offer a complete range of capital equipment, supplies and biomedical services to help your facility be fully-prepared for this year’s flu season. Hurry, our stock of Refurbished Maquet Servo-i Respiratory Ventilators won’t last long! Call 1-800-462-8195 today and ask your sales consultant for special pricing options. For more information on DRE’s full selection of equipment and services, visit dremed.com. Connect with your peers on our social networks for exclusive deals and industry updates.